(MENAFN - Gulf Times) Qatar Airways has partnered with Qatarat Agricultural Development Company (Qadco) to supply Qatar Aircraft Catering Company (QACC) with fresh produce to be served onboard Qatar Airways flights from Doha and at Doha Hamad International Airport (HIA) lounges. The two-year agreement between the airline and Qadco, one of the largest vegetable and fruit producers in Qatar, demonstrates Qatar Airways' commitment to contributing towards the country's self-sufficiency goals in support of the Qatar National 2030 vision, according to a statement yesterday. QACC will purchase fresh fruits and vegetables, including cucumber, cabbage, zucchini, lettuce, carrots, tomatoes, onions and herbs, for meals served onboard all cabin classes on Qatar Airways' flights departing from Doha and at Al Mourjan Business and Al Safwa First Class Lounges. 'As the national carrier of Qatar, we are proud to support Qatar's national food security initiatives and collaborate with Qadco to supply us with locally grown fresh produce, picked straight from Qatar farms and brought to QACC kitchens, QACC senior vice president Michael Winner said. 'This agreement marks another milestone in Qatar Airways' continued commitment to supporting local food security initiatives. We look forward to continuing work with local farm producers to strengthen efforts toward, he added. 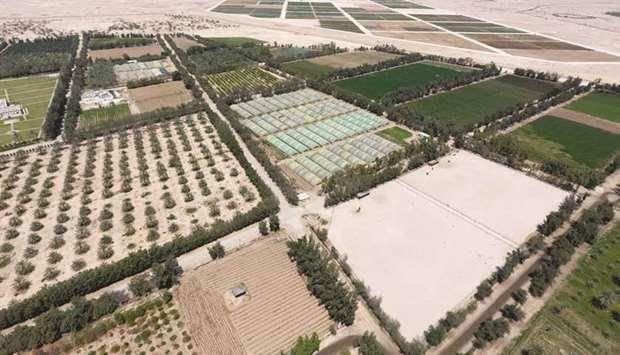 Qadco general manager Thawab al-Kuwari said: 'Our crops are picked straight from the farm, sorted, packed and delivered to our clients, thereby maintaining the freshness of the crops. 'We are cultivating different varieties of vegetables and fruits to cater to the diverse preferences of Qatar's market and Qatar Airways' passengers. We aim to expand our variety of produce offerings in the near future, al-Kuwari added. Qadco's vision is to promote self-sufficiency in unproductive and stagnant farms by incorporating new agricultural technologies. Adopting the concepts of sustainable agriculture and ‘clean farming', Qadco farms focus on maintaining ecological balance with minimal interference, rotating crops to allow the land to recover and source local compost to nourish the soil. A multiple-award-winning airline, Qatar Airways was named ‘World's Best Business Class' by the 2018 World Airline Awards, managed by international air transport rating organisation Skytrax. It was also named ‘Best Business Class Seat', ‘Best Airline in the Middle East', and ‘World's Best First Class Airline Lounge'.